Most of us take for granted that we have choice and control over the services we receive but in the disability and home care area this is not often the case. 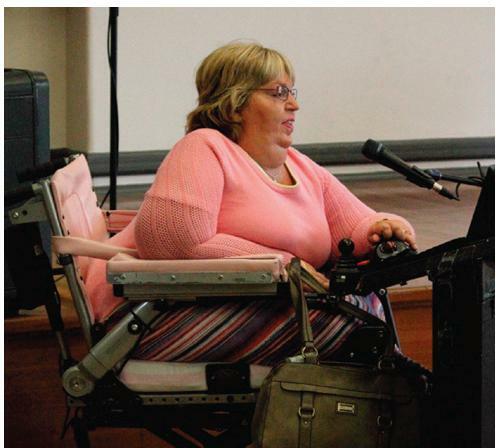 At the recent ISRC Disability Supports in to the Future Forum Ellie Roberston shared her personal experience of the benefits of self-managing her own home care. My parents looked after all of my personal care needs. I lived at home and was encouraged to experience what other able-bodied children and young adults were experiencing. I also enjoyed having both a strong Greek heritage and identified myself as a proud Australian. In my late teens, as my parents were ageing I thought it would be wise to ease myself off depending on them. I applied to receive independent personal care from the Home Care Service of New South Wales. After my father passed away, I moved out of home to live on my own. I was totally reliant on Home Care to take care of my personal care and household chores. It was a bit of a struggle though, in a number of ways. Firstly, I had no choice as to which carer was sent to me so whether I liked her or not, whether she was competent or not, and whether she was trustworthy or not, did not seem to matter to Homecare. My personal care is very personal so it was very disturbing to me when I would be sent a lady I was not comfortable with. Secondly, there were many issues on the times that my carers could attend. The worst part was my night service. I enjoyed going to bed after 10 PM however l could only do so when there was a carer available. Homecare then deciding I was difficult, outsourced my service to a privately run service provider. In 1996 I married my husband. Further problems arose with my service provider after I married. Their belief was that my service would focus only on my personal care needs. They did not look at my life and living situation in a holistic way as they should have. By this stage my disability had already progressed a fair bit and I was reliant on my husband to drive me to and from work, cook and prepare all meals, turn me and toilet me in the middle of the night, take me shopping, readjust my body and fetch me things constantly. All while he had a full-time job as well. I was told carers were not to do any ironing or tidying up for my husband or clean his bathroom. These rules made me feel worthless and whether real or just perceived, I felt that I was not contributing much to my marriage or to my home in any significant way. I needed personal care assistance but just as importantly, I needed assistance to help me run my home. This included contributing my share of the work in looking after the house. 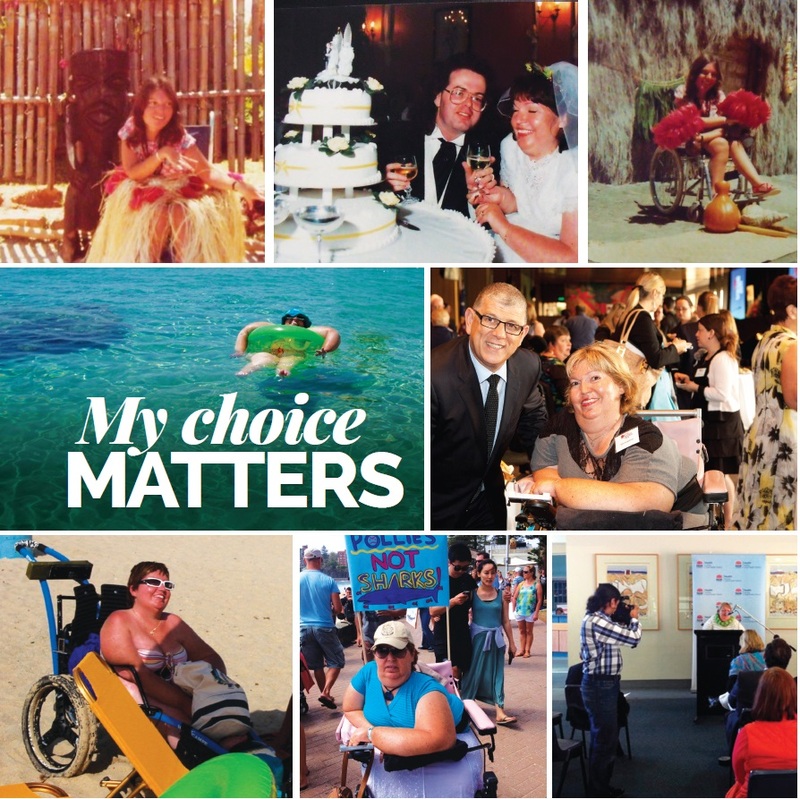 Having a disability did not, and does not; make me any different to any other woman. I did not want to just exist, I wanted to contribute! The service provider didn’t seem to understand or want to accept that there was more to my life than just having a clean body. Two years ago, I was granted an Attendant Care Program Package from the Department of Ageing and Disability in NSW. This is a self-directed individualised package that gave me the freedom to interview potential carers and ultimately hire the ones I found suitable. In this way, I was able to accept carers that fit my criteria and that they were able to work the specific hours that I wanted. I was also responsible for creating and running the rosters and deciding on the duties required. It was a new lease on life! However my package was still managed by my service provider who still held the reins somewhat. I did not have control of the wording of advertisements, the required qualifications for the carers, the type of training they received, and the amount of times I could advertise. Another big issue for me was that carers that I would meticulously find and employ would be head hunted by the service provider and given to other clients which compromised their availability for me if I needed them at different times or for backup. With my disability progressing I was finding that my approved hours were getting increasingly difficult to keep within the time limits. Carers were constantly going over time. My personal care was using up all my hours and there was little time if any, for housework or anything else. So I decided it was time to take my business elsewhere! I applied for the Direct Funding Model (or DFM) option of this package. The funding of my package would be deposited directly into my bank account and I would be completely responsible for the employment of my carers. I was granted my DFM in April of last year and I have never looked back! I had to research the legalities of employing staff, such as paying wages, super, taxes, workers Comp and public liability. Searching on the Internet I found loads of information easily. It was a lot of work but it paled in comparison to the benefits that I gained from being self-managed. I was also able to use some of my funding to purchase software that would calculate pays, and print and send payslips and timesheets. I advertise for carers myself and I get great results. I am now able to structure ads for potential carers with my own personal requirements. This greatly minimises unsuitable applicants because they respond to my particular criteria. This aspect of my care is crucial because fulfilling my needs begins with finding the right person for the right job. I am able to employ staff that I like and can click with. I interview potential carers and I have drawn up a simple contract and statement of duties that I provide new employees with along with a letter of employment offer. I am able to set my own pay rates, being of course above minimum award, and so pay higher wages, than the service providers. This helps greatly in keeping good workers because I can compensate them for their good work. I look for carers that are compatible with my level of intellect, needs and interests. I look for carers that are well presented, punctual and eager. I look for qualities of reliability and a genuine care and interest in my needs. I look for carers that do not have issues with taking directions from me. I look for carers who have an open mind and will not judge me on my way of life, my little quirks or my idiosyncrasies. My carers know that I am the employer, and this brings with it more respect to me as I am in control of their employment. I can hire as many carers as I want which I have done, and now there is always someone to assist me if one of the regular carers cannot make it. Previously, l had a lot of shifts missed because my service provider did not have enough staff. I am in a position to responsibly train my carers for tasks tailored to me. I also have the option of engaging an occupational therapist to train my staff. All of these expenses are covered in my package. I can save up some of my hours for times when I need extra assistance. I can take my carers on holidays. Another huge bonus that I get from being self-managed is that my funding does not have to pay for overheads and service provider fees. In this way, I can actually increase the number of hours of care that I receive. I now have time to do something special with my hair, or put away winter clothes or reorganise my store room or get presents wrapped for Christmas, or get assistance to just cuddle my cats. And a zillion other tasks that everybody does in their daily lives but take for granted. I am in control now of the times I get up from bed, the times I go to bed, who is cleaning me. I can accept invitations to go out with friends and take a carer with me if I choose, knowing that I can go to the toilet and shower when I come home at whatever time I please. Being self-managed with my funding has made my life complete in terms of self-care. When the NDIS reaches you, I encourage you to embrace it and don’t be afraid! You don’t have to manage the funding yourself if you don’t want to, you can choose a service provider to do that for you if you wish. Or you can have something in between and have an accountant or bookkeeper manage the money for you and you would still come out on top. I choose to do it myself because I save a lot of my funding that way so I can use extra hours. Running my own package only takes about an hour or less each week. All in all, my directed package has allowed me to be a wife, a daughter, a friend, a colleague, an employee, even a pet owner! It has allowed me to participate in my community and to do all the things that I want.